The new guidelines have been issued by the leading major world cardiology associations to update and standardize “what is a heart attack”. Confusion over how to diagnose a heart attack is set to be cleared up with new guidance launched. 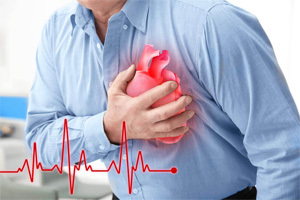 “Unless there is clarity in the emergency room on what defines a heart attack, patients with chest pain may be wrongly labeled with the heart attack and not receive the correct treatment,” said Professor Kristian Thygesen, Aarhus University Hospital, Denmark. The 2018 Fourth Universal Definition of Myocardial Infarction has been published in European Heart Journal which added the concept of “Myocardial injury” defined as a rise in troponin without other symptoms or components of myocardial infarction. The updated guidelines are the 4-year work of a committee representing cardiologists and other healthcare professionals from the European Society of Cardiology, the American College of Cardiology, the American Heart Association, and the World Heart Federation. “Many doctors have not understood that elevated troponin levels in the blood are not sufficient to diagnose a heart attack and this has created real problems,” said Thygesen, who was joint chair of the Task Force that wrote the document. A cardiac injury is defined as a rise in troponin without other symptoms or components of myocardial infarction. The international consensus document states out that a heart attack (myocardial infarction) has occurred when the heart muscle (myocardium) is injured and has insufficient oxygen. Troponin is a protein normally used by the heart muscle for contraction but is released into the blood when the muscle is injured. Oxygen shortage (ischemia) is detected by electrocardiogram (ECG) and symptoms such as pain in the chest, arms, or jaw, shortness of breath, and tiredness. As for myocardial infarction, there are different types which require specific treatment. Type 1 is the situation which most people associate with a heart attack. Here a fatty deposit in an artery called a plaque, ruptures and blocks blood flow to the heart which deprives it of oxygen. Treatment can include antiplatelet medication to stop platelets from clumping together and forming a clot, inserting a stent via a catheter to open up the artery, or surgery to bypass the artery.